Heat oven to 350°F (325°F for dark or nonstick pan). Melt butter in 1-quart saucepan over medium heat, stirring occasionally. Stir in sugar and whipping cream. Heat to boiling, stirring constantly; boil 30 seconds. Pour into 13x9-inch rectangular pan. 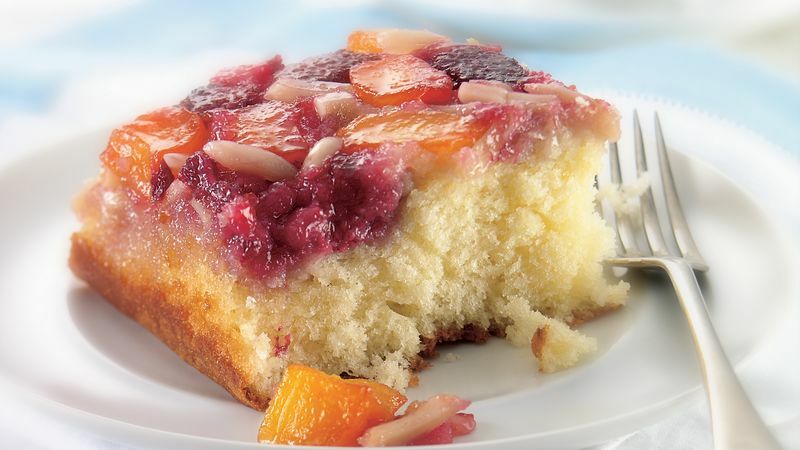 Top sugar mixture evenly with raspberries, mango and almonds. In large bowl, beat cake mix, reserved 1/2 cup mango juice, the water, oil, almond extract and eggs with electric mixer on low speed 30 seconds, then on medium speed 2 minutes, scraping bowl occasionally. Pour batter over fruits and almonds. Bake 41 to 48 minutes or until toothpick inserted in center comes out clean. Immediately run knife around sides of pan to loosen cake. Turn pan upside down onto heatproof serving plate; leave pan over cake 1 minute so topping can drizzle over cake. Cool at least 30 minutes. Serve warm or cool. Store covered in refrigerator. No fresh raspberries on hand? Use 2 cups frozen—just be sure to thaw and drain them first. Scatter a few fresh raspberries over each serving for a burst of color. Vanilla ice cream, mango sorbet or sweetened whipped cream all make yummy topping choices.